Health practitioners who have been de-registered in the past due to serious professional misconduct pose significant challenges to registration boards and tribunals when applying for re-registration. These practitioners need to demonstrate to their professional regulatory body that they possess the necessary attributes expected of a member of a caring profession. Boards are obliged by legislation to decline to grant registration to any applicant if that person is deemed not fit and proper to be a member of the profession or who poses a risk to public safety. Studies have shown a significant incidence of repeated misconduct among previously de-registered practitioners and the exercise of reregistration requires an accurate assessment of this risk of recidivism. This article examines the incidence and risk of recidivism in previously de-registered health practitioners. It also discusses how boards may more accurately perform an assessment of the risk and thereby assist them to meet their statutory obligation of public protection. Trust is vital for promoting positive health care relationships aimed at achieving positive patient outcomes. Patients, as well as the broader society, trust that health care practitioners who have been granted authority by the state to provide safe and beneficial health care are competent to do so. Recent instances where patients have been harmed as the result of treatment that fell below the accepted standard of competence have negatively impacted on trust. As the state has a responsibility to protect the public from this type of harm, legislation that mandates reporting of certain instances where the behaviour of health care professionals has fallen below the acceptable standard has been introduced. While this may have been designed to restore public trust, this article argues that it has the potential to diminish trust on the basis that mandatory reporting may be equivalent to mandatory whistleblowing. This article analyses the ability of parents and resulting children to claim compensation for negligent pre-birth genetic testing in New Zealand. It looks first at whether the parents and/or the child can claim compensation under New Zealand’s statutory compensation scheme. It then assesses whether there are any remedies in tort, namely the torts of wrongful birth or wrongful life, that the parents or the child could use. It concludes that, at present, there is no legal ability for either the parents or the child to obtain compensation for negligent pre-birth genetic testing in New Zealand. This article presents evidence for the existence of a common trajectory from work-related musculoskeletal injury to suicide. Specifically, it is argued that the pathway from injury to suicide is typically mediated by three critical events: unsuccessful return to work; the development of chronic pain or disability; and suicidal ideation in the context of chronic pain. The moderating influence of systemic factors is also examined, along with opportunities for intervention at the individual and systemic levels, the latter arising from a therapeutic jurisprudence perspective. The ability of children to refuse medical treatment is far from certain. The New South Wales Law Reform Commission report on this topic, released in 2008, addressed a number of key concerns. As yet, no action on that report has been taken. Neither the present statutory nor common law regime provides sufficient guidance on this issue. The case of Gillick v West Norfolk and Wisbech Area Health Authority  AC 112, while important, is not as far-reaching as it first appeared and has been subject to substantial limitations regarding refusals of treatment. Specifically, the position in relation to the assessment of competency, and the weight of a competent decision, remains outstanding. The ability of children to refuse medical treatment is in urgent need of attention and rectification. In 2009 the Australian Federal Government released its Maternity Services Review. Since then, homebirth has been virtually outlawed for those women who are unable to obtain one of the limited places on a publicly funded program. However, homebirth is a valid choice for women and advocating for homebirth does not reflect a desire to “turn back the clock”, as regard to the history of birth will show. At its core, the controversy over homebirth is about the control of pregnant women’s bodies, particularly when they make a choice about their bodies and their babies which sits outside of the mainstream. While only a minority of Australian women presently plan a homebirth, the issues surrounding the status of homebirth have wider implications for women and illustrate a troubling trend towards restricting choice through legal and administrative back-roads, without proper consideration of the risks or benefits involved. Misleading vaccination information undermines confidence in vaccination and may lead to reductions in the effectiveness of vaccination programs. A number of regulatory techniques can be employed to challenge the spread of false information, including health care complaints, therapeutic goods laws, consumer protection laws and professional discipline. This article examines three case studies involving the publication of anti-vaccination information by non-professionally aligned organisations, by nonregistered health professionals, and by registered health professionals under the National Law. The article examines the effectiveness of different regulatory responses and makes suggestions for future strategies to deal with the publication of demonstrably false information regarding vaccination. As with other medical specialties, litigation in sports medicine appears to be on the increase. In most countries, the applicable legal standard is “good medical practice” as identified with reference to the physician’s own field of specialisation: what is commonly done by physicians in the same specialty generally serves as the standard by which a physician’s conduct is measured. To enhance the quality of sports medicine practice, medical societies have been issuing guidelines for use by sports physicians, and a number of courts have recognised guidelines as evidence of good medical practice. One potential field of malpractice in sports medicine relates to privacy issues: an athlete should be asked to fill in a consent form if the medical information needs to be shared with other parties. Another relevant field is doping: for any act of drug prescription to be legally sound, sports physicians have to be aware of the requirements of the World Anti-Doping Agency Code and its international standards. Ultimately, the best way for sports physicians to avoid sources of liability is for them to keep up to date with the latest research and to act in a careful and diligent manner. New Zealand’s Code of Health and Disability Services Consumers’Rights came into force in 1996 after Judge Silva Cartwright’s Cervical Cancer Inquiry concluded that a research study into the course of cervical cancer had taken place at National Women’s Hospital without the participants’ knowledge or consent. The Code creates rights in respect of the provision of health and disability services which explicitly extend to research. However, in the absence of a statutory definition of “research”, its meaning and the application of the Code to research in New Zealand are unclear. This article seeks to identify the gaps and find a solution. Most health systems have historically used a mix of public and private actors for financing and delivering care. But the last 30 years have seen many rich and middle-income countries moving to privatise parts of their health care systems. This phenomenon has generated concerns, especially about equitable access to health care. This article examines what the international right to the highest attainable standard of health in Art 12 of the International Covenant on Economic, Social and Cultural Rights says about the obligations of states which use private actors in health care. The article involves a close study of the primary documents of the key institutions responsible for interpreting and promoting Art 12. From this study, the article concludes that in mixed public-private health care systems, states not only retain primary responsibility for fulfilling the right to health but are subject to a range of additional specific responsibilities. Research with people with dementia can be ethically challenging because of the effects of dementia on cognitive function. A narrative literature review of ethical human dementia research was conducted, highlighting ethical challenges that can be categorised under the following themes: substitute judgment; how capacity can vary due to risks; barriers to recruiting people with dementia; how to determine capacity to give consent; and gaining assent rather than consent from participants. The results of the review were further analysed in relation to the Australian National Statement on Ethical Conduct in Human Research (National Statement). Gaps in the National Statement include: how capacity should be determined; what defines best interests; how assent and dissent by someone with dementia should be determined and respected; and whether or not people with dementia should be included in high-risk research. The familial nature of genetic information means that information about one family member may have relevance for the health of genetic relatives; however, patients are not always willing to share relevant information. 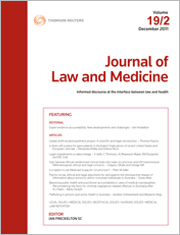 This article outlines groundbreaking legislative developments in Australia which create a lawful pathway for health practitioners to make disclosure of genetic information to genetic relatives notwithstanding refusal by the patient to consent to such disclosure. The article traces the background to this reform, and its implementation through amendments to the Privacy Act 1988 (Cth) and the introduction of enabling guidelines. It examines the circumstances in which disclosure is permitted and the protocols established under guidelines and the strengths and limitations of these reforms. Pursuant to these changes, health practitioners are not legally obliged to make disclosure but are legally able to do so without breaching statutory privacy obligations. The aim is to encourage this as best practice in appropriate circumstances but questions remain regarding the interplay between ethics and law if disclosure is indicated but not made with adverse health consequences for the relatives. For the pdf version of the table of contents, click here: LOLA – JLM Vol 21 Pt 1 Contents or here: WAU – JLM Vol 21 Pt 1 Contents.